This week, I received a surprising gift from someone who found “Wayland Spaulding” mentioned on my blog. She had purchased a box of stuff at an auction, and found a sort of day book or list that had belonged to Wayland Spaulding. From what she saw on my blog she thought it was the same person, and asked me if I’d like to have it. I said sure. She sent me a small journal with some small loose papers and cards between the pages. Apparently some had been found in the journal and others were found in the box. Yup, it was really neat. The journal sent to me this week, with loose papers. 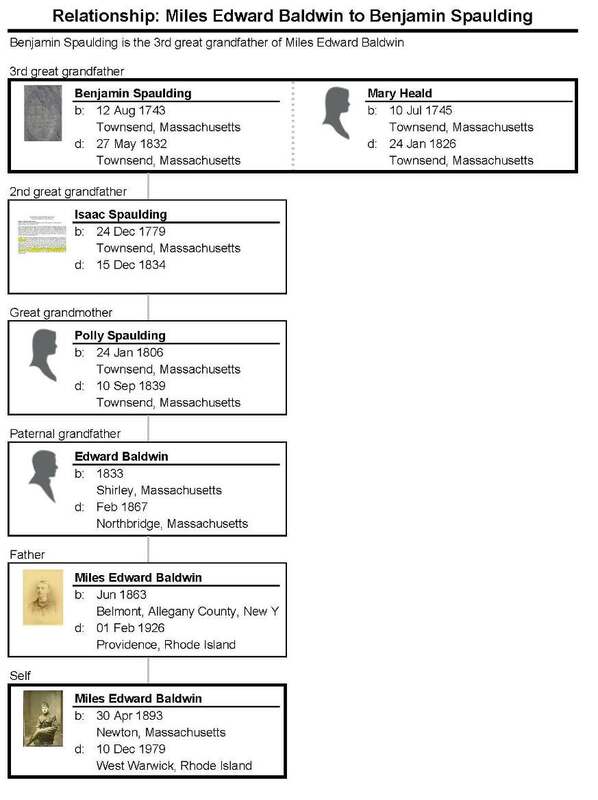 I came to know the children of my 5x grandparents Isaac and Lucy (Emery) Spaulding of Townsend, Massachusetts quite well over the years as I tried to locate my great-great grandfather Edward Baldwin in the 1850 census. He was a 17-year-old orphan and surely, I thought, family had taken him in. My efforts to pin down each of Edward’s (gulp) 19 aunts and uncles resulted in about a year of stalking; I know these people well. I also wrote about proving Edward’s relationship with them here. Edward’s son was my great-grandfather Miles Edward Baldwin and his grandson was my grandfather, Miles Edward Baldwin Jr. Edward’s parents, who both died young, were Eli Baldwin (1804-1833) and Polly Spaulding Baldwin (1806-1839). While many mysteries remain about Edward, I found that he came from such an interesting family. All four of his great grandfathers – David Baldwin, Reuben Gassett, Benjamin Spaulding, and John Emery – served in the Massachusetts militia; several were serving during the “Lexington Alarm” in 1775. They marched from Townsend down to Lexington at the start of the Revolutionary War. The Spauldings were the most interesting – a long line of teachers, and several Spauldings played important roles in the American Revolution. Three years ago, I was surprised to find letters from my 4x great-grandmother Polly Spaulding Baldwin and my 5x great-grandmother Lucy Emery Spaulding that had made their way (many decades after they were written) out to Gold Hill, Colorado, an early mining town, and were now in the archives of the Carnegie Branch Library for Local History in Boulder. That story is in How to Use NUCMC to Perform a Miracle. 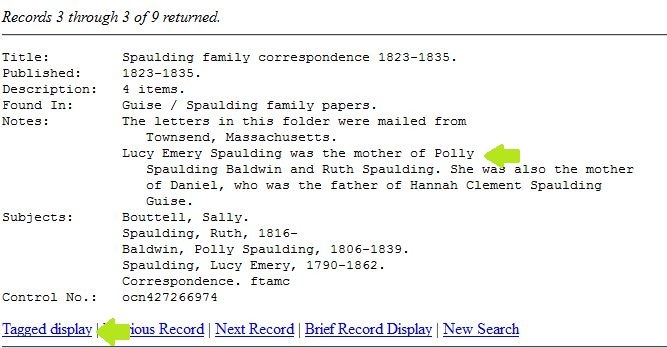 Those letters were part of a larger set of family correspondence with Polly Spaulding’s niece Hannah Spaulding Guise. And that is how I became more intimately acquainted with the children of Polly’s brother Daniel Spaulding: Hannah, Randall, and Wayland Spaulding. The title page shows that this may be the 7th in a series of journals; the others are not found. Wayland’s father Daniel Spaulding (1814-1901) was a local fixture in Townsend, Massachusetts and keeper of his father Isaac’s family farm south of the Harbor, where two of his sisters also lived most of their lives. He married Lucy Wyer Clement in 1837. According to Daniel’s obituary, he was a “farmer, cooper and carpenter.” With only an ordinary education, he was determined to educate his children more fully. Randall and Wayland both graduated from Lawrence Academy in Groton, Massachusetts, and from Yale College. His daughter Hannah became a teacher and moved to Colorado, his son Randall a school superintendent with a national reputation, and Wayland became a Congregational minister. Wayland during his Yale years, and later in life. From Biographical Record of the Class of 1874 in Yale College: Part Fourth, 1874-1909, page 195. (New Haven, Tuttle, 1912). During his years at Yale, Wayland boarded with a local minister’s family, the Pecks, and married their daughter Mary Mead Peck soon after graduation in 1874. Despite his father’s efforts Wayland was $2100 in debt at the time of his graduation. He was offered the headship of a private school and accepted the job, and he and Mary lived simply and soon paid off the debts. 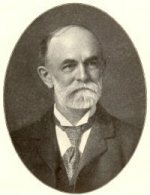 At that point Wayland decided to enter the ministry and graduated from Yale Divinity School in 1884. Wayland and Mary had only one child, Leila Clement Spaulding, born 23 Aug 1878. From the letters I saw from Colorado, and this little journal, it seems clear that Leila was the light of their lives. Her little sayings were recorded on some slips of paper, and every reference to her reflects a picture of an intelligent, thoughtful young woman and smiling, doting parents. Leila’s wedding announcement. Photo courtesy of Carnegie Branch for Local History of the Boulder Public Library. Leila, remarkably, graduated from Vassar College in 1899, received a Masters from Columbia University in 1901, and a PhD from Columbia in 1911 in Greek and Latin. She received a Fellowship for study in Athens during her graduate school years and also taught Greek at Vassar, then art and architecture at Bryn Mawr College. In 1911, she took a position as Assistant Professor at Colorado College in Colorado Springs. She taught there for three years, then left her position at the time of her marriage and there is no evidence that she taught again. Leila married Edward Winans Kent on 22 Jul 1914 in New York City. They had no children, and Edward also had no children from his first, long marriage to Anna E. Brown (divorced 1912). Edward, older than Leila, retired from real estate in 1921 and they moved to Lake Hamilton, Florida and enjoyed some travel. Leila and Edward were living in Colorado Springs in 1917 when her father’s health began to fail, and this day book records events from 1917-1918: his increasing illness, Leila’s invitation for her parents to move into her home in Colorado Springs, their move from New York City to Colorado, and their life in Colorado. Activities included some tutoring employment in Classics for Wayland, something he had done since leaving the ministry. For some reason, despite failing health, Wayland was determined to repair his son-in-law’s Columbia bicycle and go out riding. After a ride on a particularly windy day, Wayland had trouble breathing for several days, and the journal stopped on April 9, 1918. Wayland died April 17, 1918. Campus View, 1906. from Colorado College, 1874-1949 by Charlie Brown Hershey, 1949, page follows 120. And this is where the book gets really interesting. With about 75% of the book unused, and with Wayland’s widow Mary staying on in Leila’s home until her death in 1928, it’s clear that Mary spent some time recording family history information in the book for Leila’s sake. She recorded some childhood memories, and she explained the various episodes of their marriage as they moved from place to place, with Wayland taking new church positions. There was some genealogy in the midst of this. A slip of paper details the earliest settlement in America of their Clement ancestors. The back of a bible title page records all of Mary’s church memberships. A list of Wayland’s church positions is pasted to the front of the day book. The note about the Revolutionary War links, pasted into the binding of the book. Two tiny slips of paper are randomly pasted into the binding of the timeline section. With writing scrawled on both sides it was hard for me, at first, to know which side was being saved. Then I realized it was Revolutionary War recollections, perhaps noted in an earlier journal, and saved here for Leila’s possible use. Edward Kent’s first wife had been a prominent D.A.R. member in Colorado Springs; perhaps Leila’s loyal parents thought she may want to hold her own in that world someday. Leila C. Spauldings line = Leila, Wayland, Daniel, Daniel’s mother = Lucy Emery. Her father, John Emery, was in battle, Bunker Hill. At order “fire” his musket did not go. The British leaped over breastworks + Americ-s [?]. Not wishing to lose his shot – he turned, aimed at a red-coat who was just mounting ridge. The man plunged head-long, doubtless killed. This account was told to Dan’l Spaulding by his grandfather, the John Emery who did shooting. This proves [?] direct Revolutionary line. I know quite a bit about John Emery’s service, but have only found one mention of him at the Battle of Bunker Hill (testimony of Jedediah Jewett in John Emery’s widow’s pension file). His service at Lexington in subsequent weeks is better documented. Although these words “prove” nothing, I suspect they are true because of the testimony. The Battle of Bunker Hill, from the New Eclectic History of the United States by M.E. Tahlheimer, 1890, p. 140. But it was so interesting to hear an actual recollection from John Emery, who was Leila’s 2x-great grandfather and my 5x-great grandfather. Such a distant time; we don’t often think of those Massachusetts Minutemen sharing their memories with their grandchildren, but of course they did. We don’t always think of someone finding an old notebook and bothering to look for someone who will value it, but of course they do. And this story, today, is why. Thank you all. “Townsend. Death of Daniel Spaulding.” The Fitchburg Sentinel [Fitchburg, Mass.] (21 November 1901): 10. Image copy. Ancestry.com : 2016. Spalding, Samuel J. Spalding Memorial: A Genealogical History of Edward Spalding of Massachusetts Bay and his Descendants. Boston: Alfred Mudge, 1872. Image copy. Hathitrust.org. http://catalog.hathitrust.org/Record/008650976 : 2016. “Wayland Spaulding, B.A. 1874.” Bulletin of Yale University: Obituary Records of Yale Graduates 1915-1920 16: 11 (August, 1920) : 637-639. Image copy. Mocavo.com. http://www.mocavo.com/Obituary-Record-of-Yale-Graduates-1915-1920-Volume-1915-1920/397676/652#651 : 2016. A General Catalog of the Trustees, Teachers and Students of Lawrence Academy, Groton, Massachusetts, from the time of its Incorporation 1793-1893. Groton, Mass: 1893. Image copy. Hathitrust.org. http://catalog.hathitrust.org/Record/008650976 : 2016. Hershey, Charlie Brown. Colorado College, 1874-1949 (Colorado Springs: 1952). Image copy. Hathitrust.org. http://hdl.handle.net/2027/uc1.b4572983?urlappend=%3Bseq=137 : 2016. Varnell, Hannah and Robert D. Loevy. “A History of Gender at Colorado College.” Robert D. Loevy, editor. A Colorado College Reader: 255-256. https://faculty1.coloradocollege.edu/~bloevy/ccreader/ : 2016. “New of Local Courts.” Colorado Springs Gazette Issue 11685, (10 September 1912): 12. Image copy. GenealogyBank.com. http://www.genealogybank.com/ : 2016. From the Kingston, Ontario Official Program, Queen’s Birthday, 1895, p. 31. I have many saved searches on EBay in the hope that some documents or photos may turn up, concerning my ancestors. Every day, I receive in email any results of the saved search that might have turned up in the past 24 hours. I have searches for family names, towns, (and in the case of common names, sometimes a combination of the two) and also books I am looking for. Recently, my search for Townsend, Massachusetts turned up some historic documents with my ancestor’s name on them. I didn’t manage to buy the documents but I did keep copies of them. Benjamin Spaulding is my grandfather’s ggg-grandfather. Chart by FamilyTreeMaker 2012. According to The Spalding Memorial Benjamin Spaulding had ten children: Benjamin b. 1767, Peter b. 1769, Mary b. 1771 (m. Peter Lawrence), David b. 1773, Joel b. 1775, Abel b. 1777, Isaac b. 1779, Sarah b. 1782 (m. Peter Shumway), Ephraim b. 1786, Nancy b. 1789 (m. Cushing Wilder). Only three were daughters, so according to the book all pursued teaching at some point. I have recorded the contents of the documents, which I am transcribing here although I cannot utilize the pictures since the photographer (the eBay seller) owns those. There was no provenance indicated at all for the documents so I don’t know how they came to be placed on EBay. 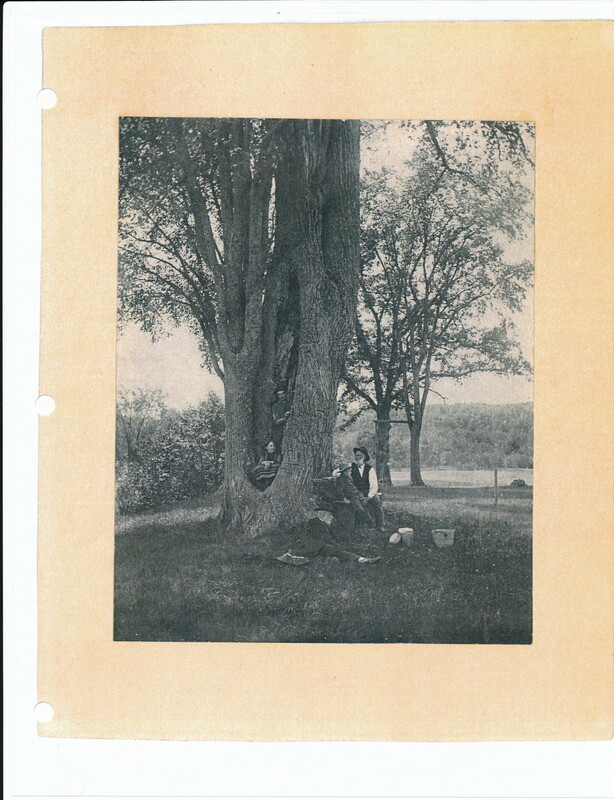 A picture, possibly of Benjamin’s grandson Daniel Spaulding (man in white shirt), son of Isaac, who remained in Townsend on the family property. Daniel’s daughter Hannah became a teacher and moved to Gold Hill, Colorado, where this picture was among her family documents. Children and other man unknown. Photo courtesy of the Carnegie Branch Library for Local History of the Boulder Public Library. 2. List of names, evidently associated with document 1. Each name has an X between the first and last name. Almost every name has a mark before it. Some names have a mark after them that looks like “Vn.” I am not sure what that is but have repeated it here. 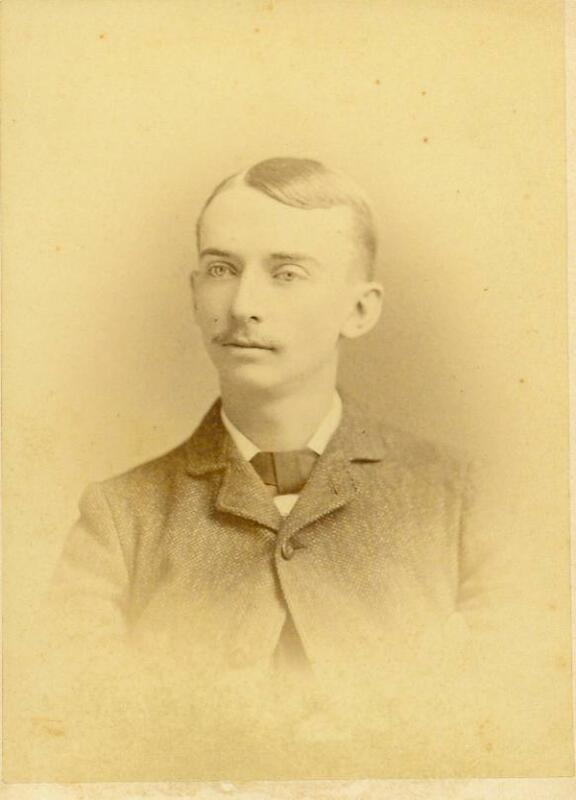 Benjamin’s great grandson Randall Spaulding (son of Daniel) who became the Superintendent of Schools of Montclair, New Jersey in the late 1800’s. 3. School payment list. This paper appears to be two sheets, side by side. Each had previously been folded. They appear to be similar lists, from different years. It also occurred to me that this content would be helpful to other family researchers. I have no evidence of the provenance or authenticity of these, but they certainly look authentic in the pictures. In Memory of Lieut. 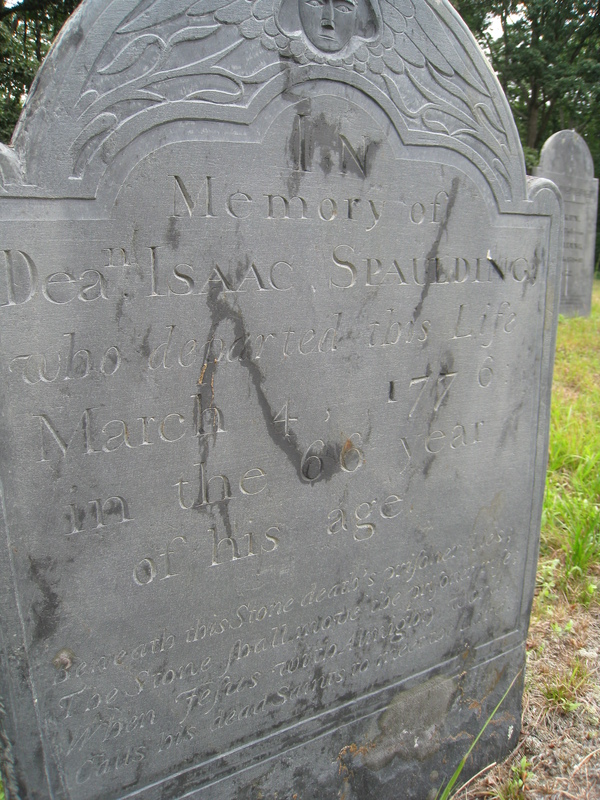 Benjamin Spaulding who died May 27, 1832, aged 89. 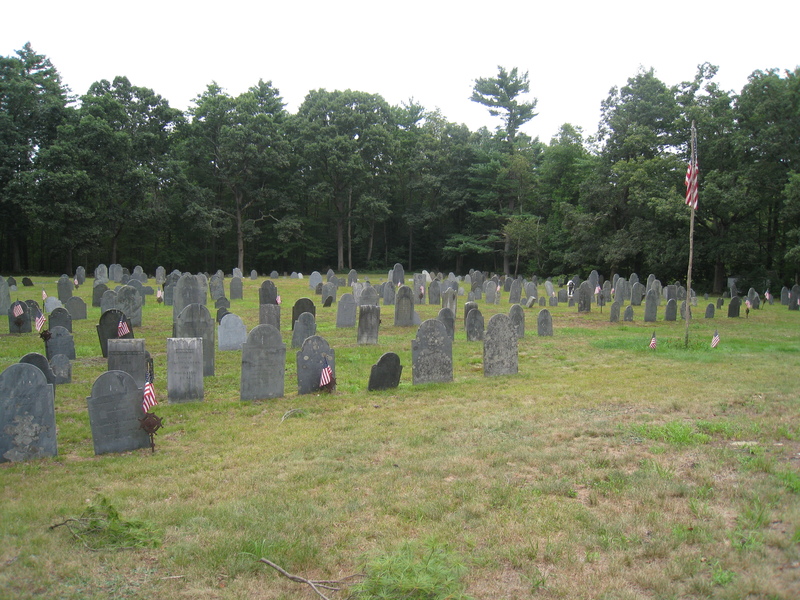 Old Burying Ground, Townsend, Massachusetts. For instance, instead of saving a general search for Townsend (which would have too many results) I have it set to search every category for Townsend Massachusetts. To save the search, at the top of the column of results, look for a star and “Save Search”. A box comes up allowing you to name the search and showing you that by default, you are set to receive a daily email of any new results. You can turn that off if you like, and just save the search query to use now and then. But I think the emails work very well, and if you make your search specific enough, don’t have to produce lots of unwanted results. When the emails arrive, they provide a link to each listing (up to a maximum of 12). I have many searches that produce no emails; they remain in my account on the chance that something might turn up someday. The story of finding Spaulding family artifacts at the Carnegie Branch Library for Local History of the Boulder Public Library is told in my post “How to Use NUCMC to Perform a Miracle”. 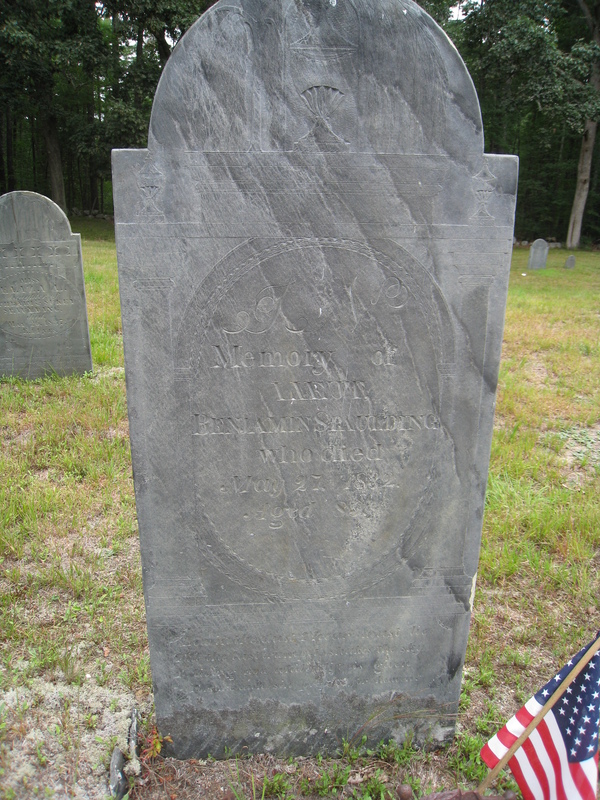 Benjamin Spaulding’s grave photographed by Diane Boumenot. 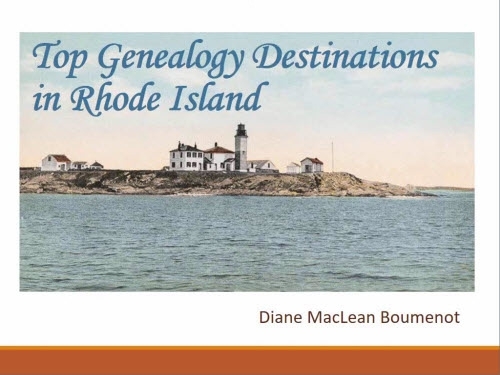 Thanks to Randy Seaver’s recent blog post, I learned about a new set of documents released on the FamilySearch.org website – Massachusetts Land Records 1620-1986. I really couldn’t believe my luck. 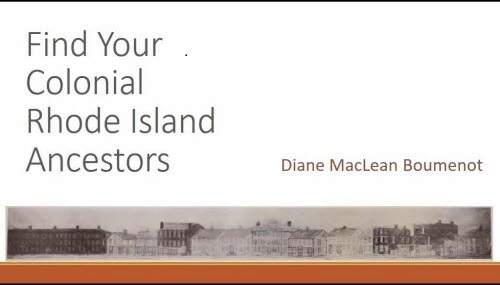 The collection includes deeds and mortgages from all counties of Massachusetts. Available years vary by county. According to the website there are 5,766,135 images. Yup, over 5 million. And, it’s free. However, this collection is not yet digitally indexed. That means you must select the county you want, and select an index volume for a certain time period, look there for a name, note the book and page, and then move on to open that book (actually, it’s like opening a roll of microfilm) and find the page. It’s just like using Family History Library microfilm, except of course that this is free, and you are using it conveniently from your own computer, where you can easily save the documents you find. 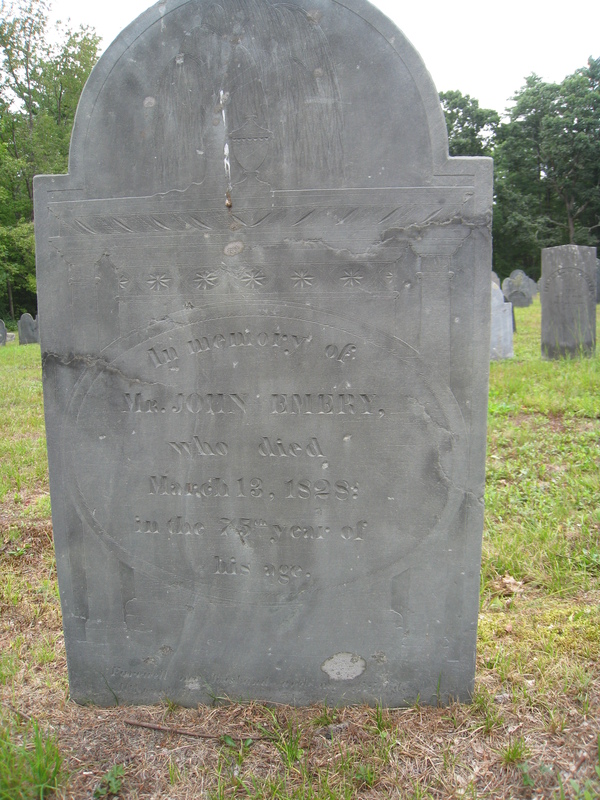 I decided to start with some Townsend, Massachusetts deeds to see if I could learn more about the life of my mysterious ggg-grandfather, Eli Baldwin, who died in 1833 at the age of 29. When his young widow made a will and died, six years later, her probate record did not mention any real estate. Of course, I have no idea if this is my Eli Baldwin. The index styles vary from county to county, but in Middlesex, towns are not listed in the index. You have to go by name only, and find the town on the deed itself. Back on the Middlesex County page, I pulled up volume 283 from the Deed books. I found page 478 by guessing, and checking the page numbers that came up. Know all men by these presents that I Abigail Durant of Concord in the County of Middlesex and Commonwealth of Massachusetts widow in consideration of three hundred dollars paid me by Eli Baldwin of Townsend in said county carpenter the receipt hereof I hereby acknowledge do hereby give grant sell and convey unto the said Eli Baldwin his heirs and assigns the following parcels of real estate situated in said Townsend to wit so much of the real estate whereof Isaac Durant late of Townsend died as was assigned to me as dower in said estate the reversion therein was conveyed to me by Henry Hoar administrator to said Estate by deed dated June 11 1825 and for a particular description of said premises reference may be had to said deed and to the Report of the Commissioners who assigned said dower and to the record thereof in the Probate Office in said County and also one eighth of an acre of land be the same more or less and has thereon a barn the other half thereof was and is a part of said dower and the said eighth of an acre is bounded as follows to wit on the west or southwest by said dower on the south or southeast by the road leading from the harbor to Lunenburg and on all other points on land late of Wallis Little deceased with all the privileges and apurtanances thereto belonging … the twentieth day of June in the year of our Lord one thousand eight hundred and twenty seven … in the presence of Luther Lawrence and Henry Hoar … before me Luther Lawrence Justice of the Peace. — Middlesex Co. Oct 7, 1828. Sure enough, the property was in Townsend. Eli was listed as a carpenter. Since I have a record that Eli made coffins and was paid by the town (2), this is really fitting my Eli Baldwin. Another clue is that the land was on the road from “the harbor” (that is, near Harbor Pond) to Lunenburg, which is near the area I have identified for Eli’s in-laws, Isaac and Lucy Spaulding. The location (map below courtesy of Google Maps) might be the road I have marked in red. In an 1875 map, there is a “J. Durant” nearby (which could be the remaining Durant property, since the widow was only selling a portion of her dower). Eli married Polly Spaulding in Townsend on 28 May 1829. Daughter Catherine was born in 1831 (birth registered in Shirley (1)) and son Edward (my gg-grandfather, birth date from 1860 census only) in 1833. The property purchased may just be a workshop, or a workshop and home, but only a barn is specifically mentioned. I would say at this point, the deeds are very likely to be my Eli Baldwin, but I don’t think it is proved. I expect that the witnesses Paul Gerrish and Asa W. Baldwin are significant, although I don’t yet know who they are. I am not familiar with the Durants, but I expect we have no connection to the buyer, James L. Walton. Now I can see there was part of a house included in the property, and that there was a mortgage. This must have been where Eli brought his bride Polly after their marriage in 1829. The property was sold in October, 1831 and their first child, Catherine, was born in late December, 1831, in Shirley(1). Shirley is the next town, just south; I wonder if they were with family, or renting. Perhaps a child would not have fit into the living arrangement on the property described in these deeds. These deeds have moved my understand of Eli and Polly’s brief and perhaps troubled marriage further along. Investigate all names mentioned on the deeds and compare them to the probate records I have. I recognize the name Paul Gerrish but I cannot find it in Edward or Polly’s probate records. Compare the property boundaries further to any existing maps; look at the probate record cited for the Durants for a further description. Look at the many Spaulding deeds to learn more of their exact location and story; Polly grew up nearby. Investigate (Eli’s father) Abiel Baldwin’s deeds. Continue to explore Middlesex County deeds and also many deeds in Norfolk County (Wrentham) of the Aldriches and Darlings, as well as other isolated deeds that may answer other questions. I expect I will be looking at dozens or even hundreds of deeds. Save the deeds used to my own files. (2) Hallowell, Henry C., ed. 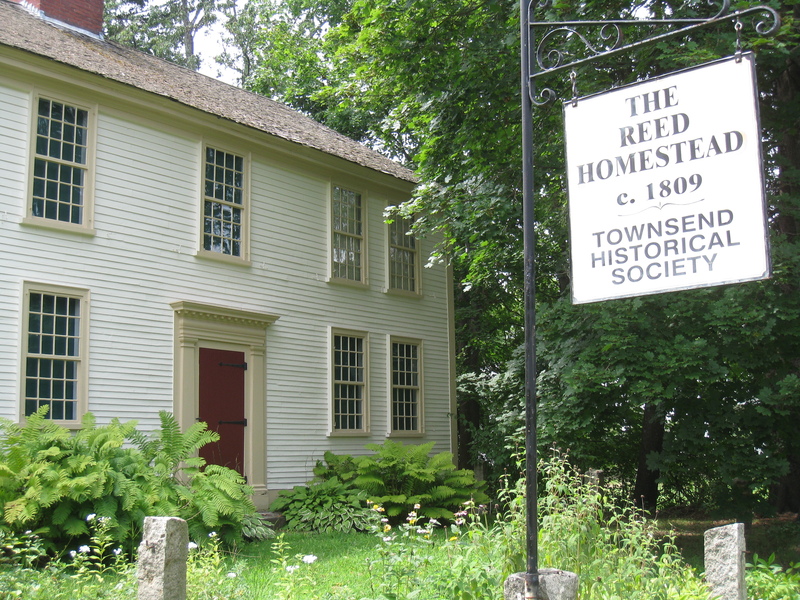 Vital Records of Townsend, Massachusetts, Town Records to 1850 with Marriage Intentions to 1873 and Cemetery Inscriptions. Boston: New England Historic Genealogical Society, 1992, p. 464. “The Falls, Harbor Pond, Townsend, Massachusetts” from an old postcard. 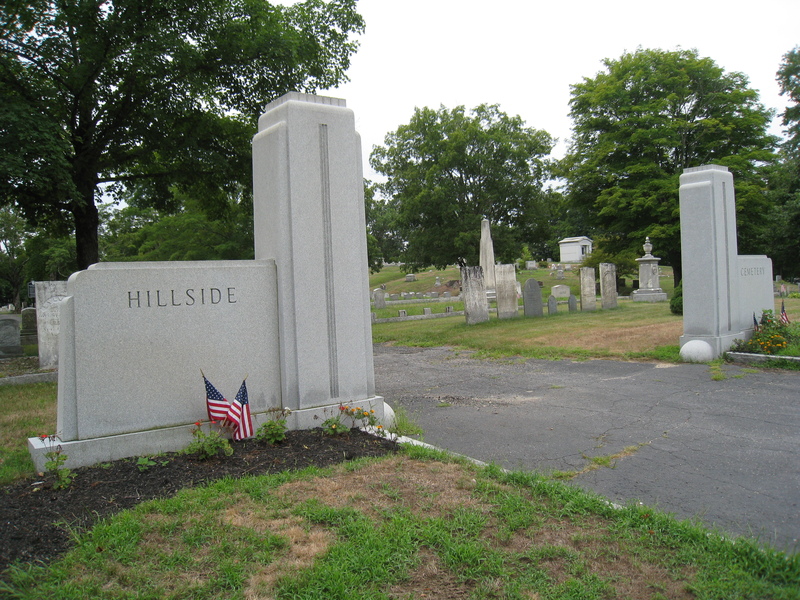 Since my good fortune last spring in finding my Baldwin and Spaulding ancestors in Townsend, Massachusetts, I have been trying to pin down what became of my great great grandfather, Edward Baldwin. Born around 1832 or 1833 to a father (Eli Baldwin) that died in 1833 and a mother (Polly Spaulding Baldwin) that passed away in 1839, Edward and his sister Catherine were orphans before they were 10. The only record I have of Edward after 1840 is an 1860 census record in Amity (now Belmont), Allegany County, New York and an undetailed 1867 death record in Northbridge, Massachusetts which may or may not be him. Polly’s 1839 probate records indicated that her brother John Spaulding would be the guardian of the two orphans, Edward and Catherine Baldwin. That Edward & Catherine Baldwin are minors under the age of 14 years & children of Eli Baldwin, late of said Townsend, dced, that they have no mother; that there is [ ] for a guardian, that the petitioner is the Uncle of said minors (–Middlesex County, Massachusetts, Probate Court, Polly Baldwin Probate file, file 857, Middlesex Probate Court, East Cambridge, Massachusetts). One thing that jumps out at me (there are several mentions of the guardianship in the Probate pages) is the way Polly is not really a factor in the custody of the children. Clearly, she may have chosen her brother (I suspect she knew she was dying, from the wording of the will, 2 months before her death) but the official documents always list them as Eli’s children (Eli had died in 1833) and any preference expressed by her is never mentioned. I am hoping to find Edward Baldwin during the period 1850-1860, or to find any relative who moved out to western New York, where Edward was by 1860. I am not able to definitively place the children with any family member in 1840 just using the census record, not even with John, although it is possible. So I set my sights on the more complete census data of 1850. When possible, I also looked at the Massachusetts census of 1855. Isaac Spaulding Jr 1807 – 1888: was married in 1839 to his second wife, Cynthia Ann Matthews, and had been in Harman, Ohio for at least 10 years in 1850. 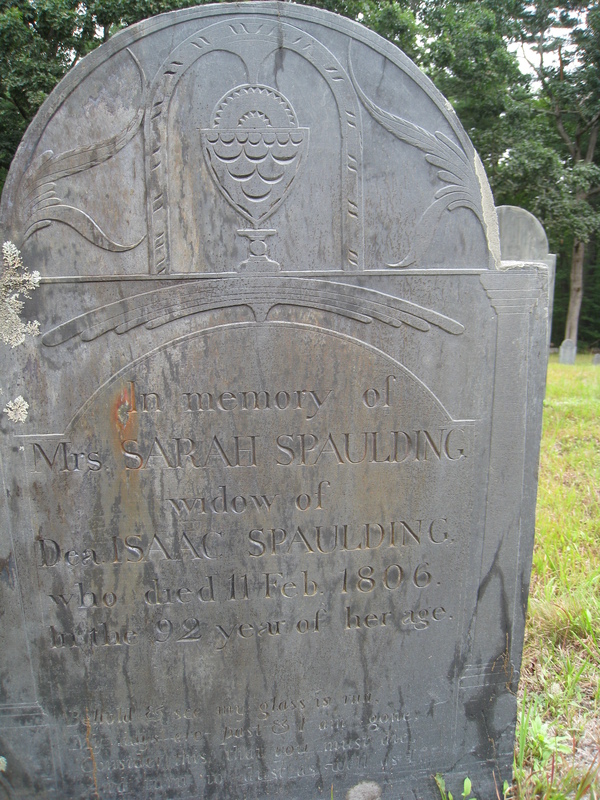 John Spaulding 1809 – 1882: a pump maker, later “merchant”, married for the second time in 1832 and by 1850 was living with his wife and four children in Townsend, where he died in 1882. Lucy Spaulding 1812 – 1903: married Flint Ball in 1833, and became a widow in 1847, and remained a widow in Townsend until her death in 1903. Edward’s sister Catherine Baldwin, age 18, is living with her and her two young sons in 1850 (page 2 of the Townsend federal census record). Polly lost one of those two sons during the Civil War. Daniel Spaulding 1814 – 1901: was a farmer, and I speculate, but don’t know yet, that he may have taken over the family farm after the death of his father. In 1850, he has his wife, two children (including Hannah Clement Spaulding), his mother Lucy, and two unmarried sisters, Ruth and Harriet, in the household. But not Edward. Ruth Spaulding 1816 – 1888: never married; living with brother Daniel in 1850, above. From some family letters found in an archive, I know that she was in Lexington in 1835. I assume she was at some sort of school since her mother wrote of her coming home for the summer. There may have been a school called “Lexington Academy” from 1822-1838. It’s also possible Ruth had some sort of job, or was visiting. She spent the rest of her life in Townsend with family. 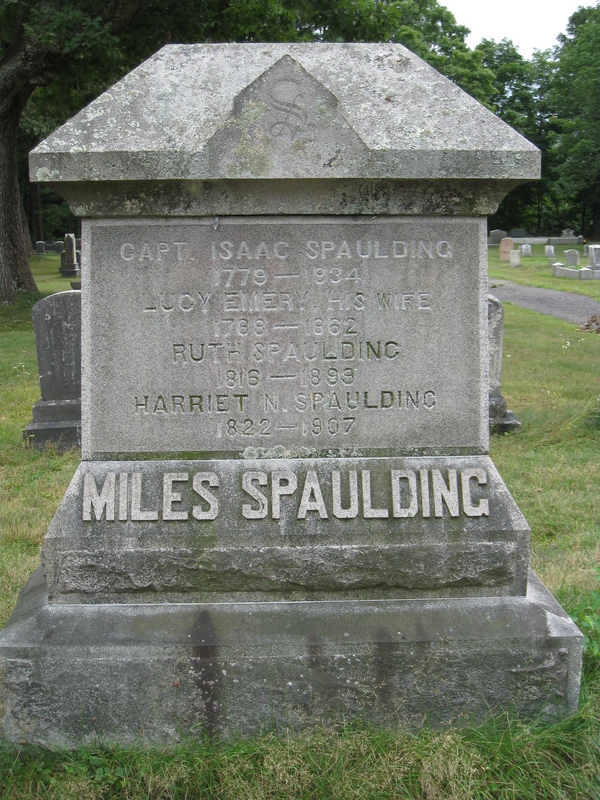 Miles Spaulding 1819 – 1896: A young physician, Miles was living with his first wife and his mother-in-law in Dunstable, Mass. in 1850. A year later, Miles would move to Groton, Mass. and practice there for the rest of his life. Knowing Edward later named a child after Miles, I looked around the Dunstable census record for him, but noticed nothing. Miles married second wife Mary Mehitable Stickney in 1863. The house they later lived in (which I believe had belonged to her father, Stephen Stickney) is now known as Prescott House, on the campus of Lawrence Academy. Harriet Newell Spaulding 1822 – 1907: Never married; living with brother Daniel in 1850, above. Harriet graduated from the Lawrence Academy, Groton, Massachusetts, in 1841. Several of her nieces and nephews also graduated, later, but not Edward. 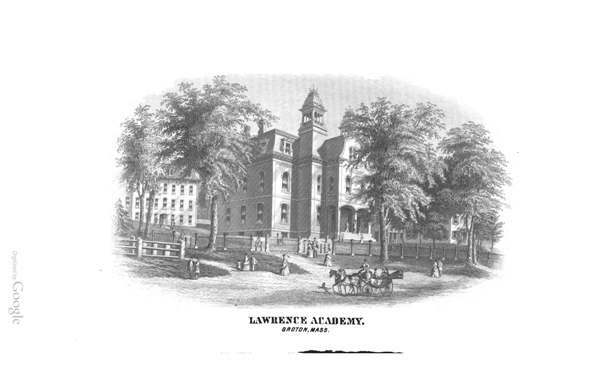 Lawrence Academy, Groton, Massachusetts, from A General Catalogue of the Trustees, Teachers and Students of Lawrence Academy, 1793-1893, Groton, 1893. Nancy Cushing Spaulding 1826 – 1917: was just married to James Gilson; in 1850 they were enumerated next to Nancy’s brother John, and James Gilson was working as a pump maker. I looked for several pages back, and ahead, on these census records for any sign of Edward. Not finding him with the Spauldings, I know he could possibly have been in with the other side of his family, the Baldwins. One clue about this is contained in a letter Polly wrote in 1835 in which she mentioned that Edward was currently visiting “his GrandFather” who must have been his grandfather Baldwin. These are the siblings of Eli Baldwin, children of Abiel and Lucy (Gassett) Baldwin of Pepperell, Mass. Abiel and Lucy died during the 1840’s. Minot Baldwin 1803 – 1878: married Sophronia Hall in 1824, by 1850 only two of their children were still at home in Townsend. Minot is listed as a carpenter in several records. Royal Baldwin 1806 – 1848: married Mary Frank in Boston in 1843 (Records of the Hollis Street Church in Boston, p. 109, AmericanAncestors.org); the Baldwin Genealogy reported that he died in 1848; there is a cemetery record for the Central (Common) cemetery in Boston (Boston, MA: Old Cemeteries of Boston. (Online database: AmericanAncestors.org, New England Historic Genealogical Society, 2007) however the birth date seems off, so I will research this further. 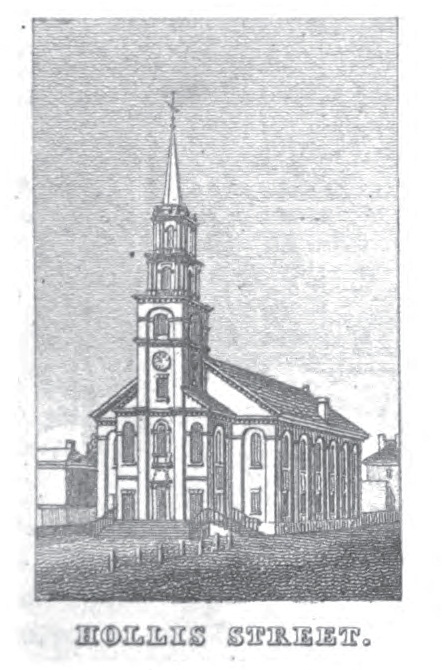 Hollis Street Church, 1810-1885, p. 116, Bowen, A. (1838). Bowen’s picture of Boston: or the citizens and stranger’s guide … 3d ed. Boston: Otis, Broaders and company. Mary Baldwin 1807 – 1873: married William Wright, a farmer/blacksmith, in 1833; this was recorded in Boston. I noticed that the marriage date was exactly two months after the death (in Boston) of Eli Baldwin and I managed to scroll easily through the 60,000 pages of handwritten records in that set (on Ancestry.com) and find a record of Eli’s death I hadn’t seen before (I have no idea why that was so easy- I guessed a page number and I was only 100 pages off). Anyway, by 1850 the couple had 11 children and were living in Townsend (U.S. 1850 census for Townsend, family#81; pages are incorrectly ordered on Ancestry.com). Levi Baldwin 1809 – 1862: a peddler, he died of consumption in 1862 in Sandwich, Massachusetts. He had a wife Elizabeth and possibly two children; the Baldwin Genealogy says his wife was Mary Hinds. I cannot locate him in the 1850 census although in 1855 he is with Elizabeth in Sandwich. James Adams Baldwin 1811 – 1884: a farmer (later laborer), James married Catherine Mead in 1837. In 1850 they were living in Dublin, New Hampshire with several children. Elbridge Gerry Baldwin 1812 – 1886: was a cooper, later, farmer. Elbridge married Mary Fisk in 1838 and they had one son, John Elbridge, born 1842. 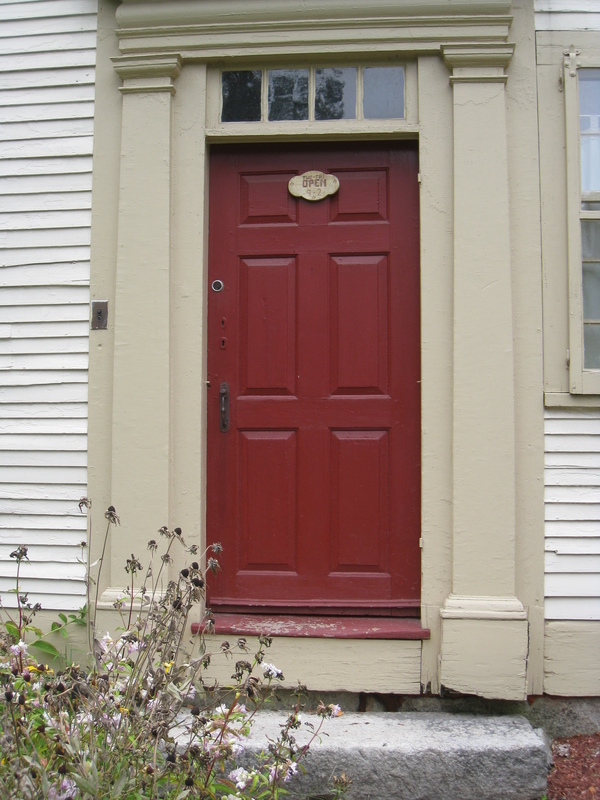 In 1850 they were living in Claremont, New Hampshire; later they would live in Jaffrey. Albert Baldwin 1814 – 1887 : a farmer, Albert married twice. In 1850 he was living close to Finis in Pepperell with his first wife, Olive Bailey, and their children. Lydia Baldwin 1816 – 1886: married an older man as his second wife, Abel Babcock, and lived in New Jersey where they raised 6 or 7 children. They were married in 1838 in Boston at the First Universalist Church, Hanover Street, Boston (a few blocks away from the Old North Church). Abel was a War of 1812 veteran, and earned a pension. Finis Baldwin 1818 – 1891: she married farmer Leonard Blood in 1840. In 1850 they lived in Pepperell with their newborn son and “Lucy Wright”, age 11 – perhaps Mary’s daughter (also enumerated in Mary’s household). Lucy would have had plenty of experience with babies in her parent’s household. Alpha Baldwin 1820 – 1891: a carpenter, Alpha married Elizabeth Jones in 1850 and they appear in the 1850 census apparently living near her family in Hillsborough, New Hampshire. New Hampshire is very close by, and might have been overlooked by me when searching for Edward Baldwin, so I launched another search, but nothing. Henry Baldwin 1823 – 1908: a shoe maker, never married, listed as deaf in the 1860 and 1880 census. By 1850 both of his parents were dead, and he lived over the years with or near various siblings. In 1900, age 77, he listed his occupation as “Capitalist.” I think I like this guy. Pursue the details about Royal Baldwin and Levi Baldwin – there is a gap in both their stories. Follow up on those Baldwins that seem more closely linked to Edward’s father Eli: those who lived in Boston, those who demonstrate woodworking skills, and those closest in age. Do some more serious research on father Eli Baldwin, if possible. Continue to search for any Civil War activity. About all I’ve found is some indication that he could have walked away from his unit during a march in western New York early in the war – no idea if that is him. Find new ways to look for him in New York State, since he was in Allegany County by 1860. Consider the times – could a 17-year-old have made his way, say, to the California gold mines in 1849? Could any “missing” relative, above, be there? Any other possible destinations that I’m overlooking? I started this particular project looking for solid clues, but finding none, I realize that finding gaps or inconsistencies is the next best thing. Let me just put in a good word for knowing the whole family – it makes searching easier in ways that are hard to describe. In this case, it hasn’t solved the problem yet, but it is probably the only path that will ever work. The Baldwin Genealogy by Charles Candee Baldwin, 1881 (see page 717 of the “John of Billerica” section). The Spalding Memorial by Samuel Spalding. 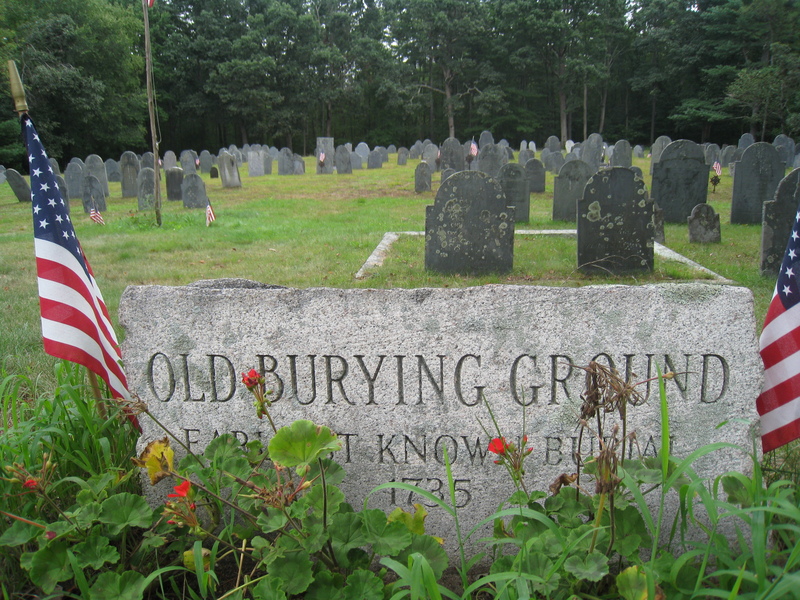 Old Burying Ground Headstones, Epitaphs, Ancestry & Revolutionary War Patriots compiled by Susan Woolfrey Teachout, 2011. Cutter, Daniel B. History of the Town of Jaffrey, New Hampshire, Concord, 1881. Census and vital records accessed through Ancestry.com, FamilySearch.org, and AmericanAncestors.org. Based on advice I heard at many sessions during the FGS 2012 conference in August, I decided to consult the National Union Catalog of Manuscript Collections. 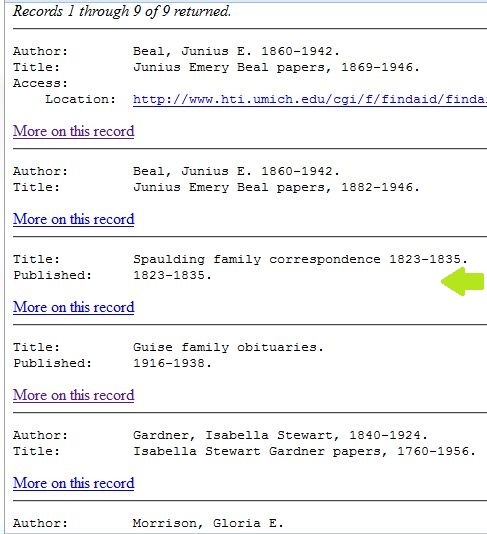 I was familiar with NUCMC from my college library days, but to be honest I hadn’t thought enough about consulting it for genealogy. I think I focused on the word “manuscript” and didn’t think of it in the very broad sense of any unpublished papers. Searching for “Spaulding” and “Townsend” brought up an entry for some letters from the 1820’s-1830’s. My great-great-great-grandmother Polly (Spaulding) Baldwin. In a set of letters? I couldn’t believe Polly (Spaulding) Baldwin’s name appeared in a set of letters. My ggg-grandmother died at the age of 33, in 1839. At the time of her death she was already a widow, living an obscure life. The idea that something she had written, perhaps a letter, had survived in an archive amazed me. If I had to rank all direct ancestors in order by how likely they were to have a personal (not legal) document in a repository she probably would have been voted least likely. For location, you must look at tag 040 a. In this case it’s CO3. location CO3 turned out to be the Boulder Public Library in Colorado. Well, that was surprising. I was on my own to actually look it up at the Boulder Library site, but that wasn’t hard because of the detailed record in NUCMC. I found what I was looking for located at The Carnegie Branch Library for Local History, and sent a message to the librarian asking if there was any way for me to get digital copies of the letters. I also saw some evidence of old Spaulding Family photos and inquired about those, too. As I was waiting for that, I looked into the Colorado folks who had left the letters to the library. I had seen the name Hannah (Spaulding) Guise of Gold Hill, Colorado before, in her aunt Harriet Spaulding’s probate documents. Hannah was likely to have been close to her grandmother Lucy and her unmarried aunts Harriet and Ruth since they all lived at her father Daniel’s house while she was growing up. I read in the Boulder library finding aids that Hannah was a teacher from Townsend, and had written to a Congregational minister in Boulder to look out for a post for her. This turned out to be Gold Hill, where she met and married miner James Henry Guise. They had at least one daughter, Mabel (Guise) Montgomery and stayed in Gold Hill for most of their long marriage. Both Hannah and daughter Mabel (also a teacher) are featured in the Revealing our Roots: Women of Boulder County site. Today the nice librarian sent me the letters. Amazingly, it turns out that three are written by my ggg-grandmother Polly (Spaulding) Baldwin (1806-1839). The fourth was written by my gggg-grandmother Lucy (Emery) Spaulding (1789-1862). I don’t know too much about the provenance of these four letters, except that they ended up in the possession of Hannah Spaulding Guise in Colorado, Polly’s niece. I don’t know who Sally Bouttell is. There are clues in here that I will be following for a long time. I have transcribed the records exactly as they appeared, with transcribing difficulties noted in [brackets]. Again I take my pen and atempt writing you a few lines, but what shall be my subject? Shall religion or the affairs of the world engross our attention? I believe the former will be of the most consequence to us, but as important as it is I feel strangly indifferent to it. My health not having been as good as usual the past Summer, and hearing others inquire what they should do to be saved, I have been led to reflect on my own state and I have found myself to be a lost sinner and continuing so I must eternally perish but still I remain in the same sinful state, I can say the harvest is past the summer is ended and I am not saved, and why? The Bible tell us that Christ is ready to receive all all who will come unto him it must be then that it is because I do not come to him that I do have life. Sometimes the world appears to me as it really is trifling and vain not worth an anxious thought heaven and hell seem to be realities, but soon the world intervenes between God and my soul and I am left to pursue a phantom. After so long a silence I hardly know whether I ought to write at all. But as unworthy as I am of your correspondence or friendship yet I still wish to preserve them. But though my not writing before may have the appearance of neglect, yet I think if you knew how my time has been [taken?] up you would forgive me. I have begun to write more than once and have not had time to finish. Perhaps you would like to know how my time has been employed. Not very profitably I assure you. The first two weeks then after I received your letter I was almost sick with a cold, and a lame arm, which prevented my doing but little of anything. Since then I have been at school almost every day, and of course had but little time to write except the evening and in cold whether among so many by one fire it is very inconvenient to write. I went to a party at Captain Turner’s three or four weeks ago. There was between twenty and thirty young people nearly of my age. The evening was spent chiefly in playing and although I joined in the play with my gay companions I am far from approving our conduct. No I will not attempt to excuse what I know to be wrong, nor will I knowingly be the advocate of sin, how much soever I may be the subject of it. To me my own fireside with a book or a friend would have been far more agreeable than such childish amusements; gladly would I have exchanged my seat then for one by your side. I went to Mr. [Hubbard’s?] school three days the week before last – I think he is a very good master. I think he has been unjustly blamed for his conduct respecting Lucy W. and Thersa P. I should consider it a great privilege to attend such a school as his; he prays night and morning in his school. I like his praying very much, they are short but very comprehensive; I think he is a very pious young man and anxious for the welfare of his scholars. A [neat?] difference between him and our master who seems to care but little whether his scholars study or play, and as to religion he appears to scorn the very idea. How quickly another winter has fled and gone beyond [really?] The lovely spring approaches and soon it will appear in all its beauty. May it be a delightful one to us. May our life, health and sense be open to us, to enjoy it. And while we admire the beauties of nature may we be led to adore the author. How often have I wished for a friend before I met with you, but I find there [is?] but few among my acquaintance who are real friends. But if I have one friend, I shall think myself happy. I trust I have commenced a friendship with you which I hope will last as long as we exist. No I never shall forget you. Let others do as they will; were I in any way worthy of such a friend as you I should be [far?] better than I am at present. I think by this time you must be tired of reading such scrawls as mine – Forgive what [ ] wrong and if I have written anything which deserves an answer I [sh****] [**pect] one soon. [on back:] I thought I should have seen you before this time. I hope you will come and see me soon. I was quite surprised to hear after I had been gone from home a fortnight that you had started the same day that I did. I was almost sick with a cold all the time I was gone, I think I never had a worse one. I stayed at Father’s 10 days at uncle S’ 4 days & nearly a fortnight at Lucy’s. Edward is at his GrandFather’s now. I expect to move before a great while. John wants to fix the chamber first. I expect to go to Mr. K. Bloods to work a while this month if I am able. I suppose I shall not be able to write much news beside what mother has written. Things go on here very much as usual. N. is as uneasy as ever &c &c. We want you to write again soon and let us know how you get along. You need not take pattern by us we have spoken about writing very often but that was not writing I know. We thought at last we would wait for your gown but it is done so poorly that mother concludes not to send it. There are additional photos and documents in the archive that I will explore. These letters will go a long way to help me start exploring the Spauldings. By the time of the 1835 letters, above, Polly was a widow, and the “Edward” she named was my mother’s great grandfather, Edward Baldwin. She died in 1839. I intend to follow up on each person and fact mentioned. I never expected to see a letter from either Polly or Lucy. The letters from the teenaged Polly show a sensitive girl trying to figure out her world. I love the image of the large family gathered around one fireplace, and I love the chatter about the new dress not being right. I sounds just like a conversation I would have with my daughters today. 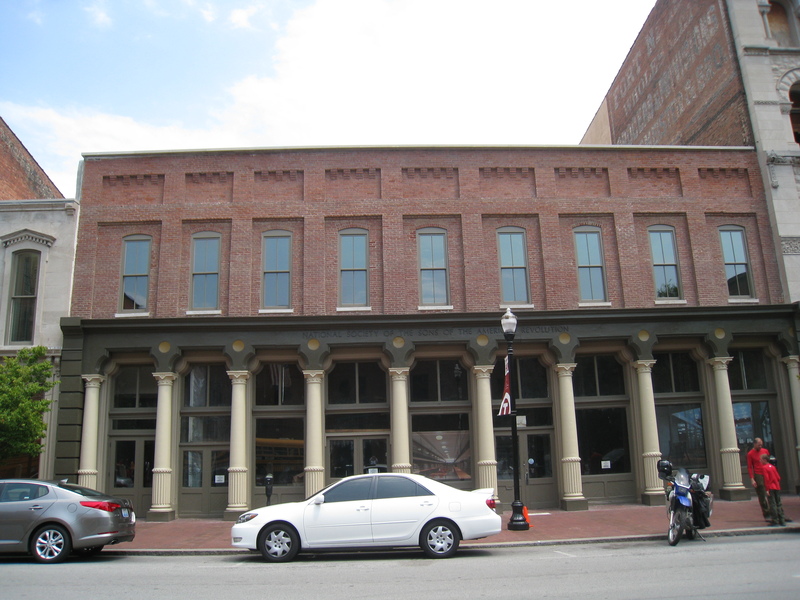 While preparing for a business trip to Louisville, Kentucky, I was surprised to discover that the Sons of the American Revolution Library was just down the street from my hotel. I have recently found some evidence that individuals in my “new” lines of my grandfather’s Baldwin and Spaulding ancestors served as Massachusetts Minutemen during the Revolutionary War, and I was eager to see if I could learn more. The Library moved two years ago to a location on West Main Street’s “Museum Row” – a neighborhood filled with museums, school buses, families, and a surprising amount of statuary. 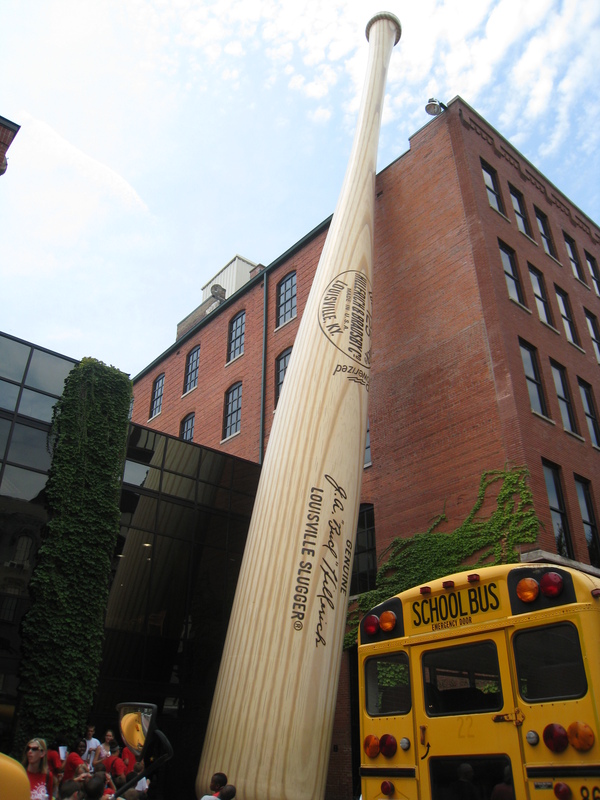 If you are ever looking for the library, it’s impossible to miss because it’s right across the street from the Louisville Slugger factory and museum and there is a giant, and I mean giant, baseball bat in front of that building. So, look for the giant bat. Eventually, the SAR hopes to fill the rest of the building they’re in with a museum of their own. I think that’s a wonderful idea. I emailed the head of the library, Michael Christian, in advance to make sure the library would be open during normal hours that week and to ask him if he would mind if I took some pictures. He said it was fine. I managed to visit the library on Tuesday afternoon and Friday morning. Admission is $5 for non-members. The receptionist was very nice and showed me a locker for my belongings. I brought in only a notebook and my camera. Inside, I met Mr. Christian and he gave me a tour and we talked about the research I was doing. The library did not disappoint. 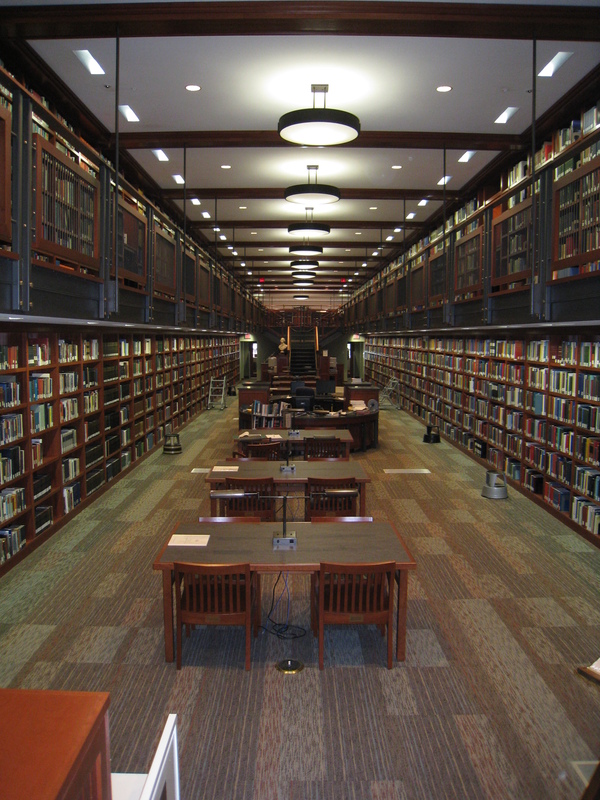 It’s quite new, of course, but above and beyond that it has a clean, orderly, uncluttered atmosphere unusual in a genealogy library. 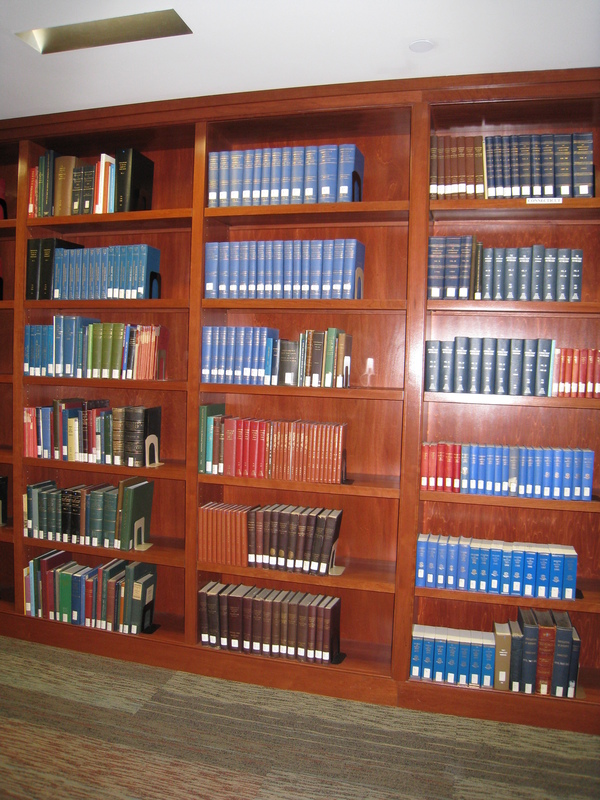 The collection of books is focused on American history, genealogy, and local history. Many sets of books that I had seen elsewhere just looked better at the SAR Library thanks, I suspect, to a significant amount of re-binding which kept the books in excellent shape. Pretty much all areas of the country are covered but I never ventured past the New England section. There were compiled military indexes, such as the Massachusetts Soldiers and Sailors of the Revolutionary War. There were far more family genealogies than I expected. I welcomed the chance to find something privately published that I may not have seen before; there could be clues in such a book. That didn’t really happen, except for one manuscript about the Lampheres that I had previously only seen online. There were some resources available on the computers, and I looked up SAR applications related to people in my family. I found four that I wanted to see, and the microfilm was brought to me. The microfilm equipment was quite nice, by the way. I paid for the pages I printed. Private in Captain Henry Farwell’s Company, Col. William Prescott’s regiment, enlisted April 25, 1775. Service, 98 days. Private in Capt. 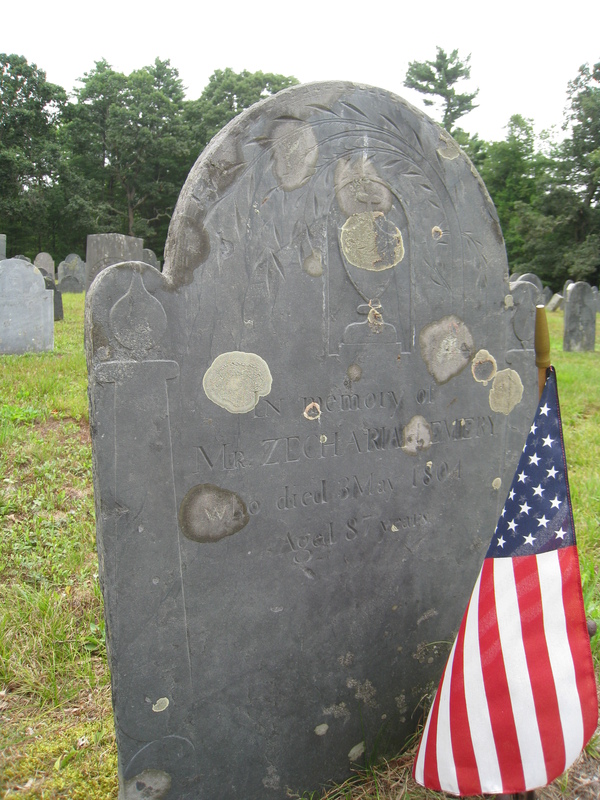 Zachariah Fitch’s company, Col. Samuel Brewer’s regiment, enlisted August 23, 1776, discharged September 30, 1776. Service, one month, nine days. Corporal in Capt. 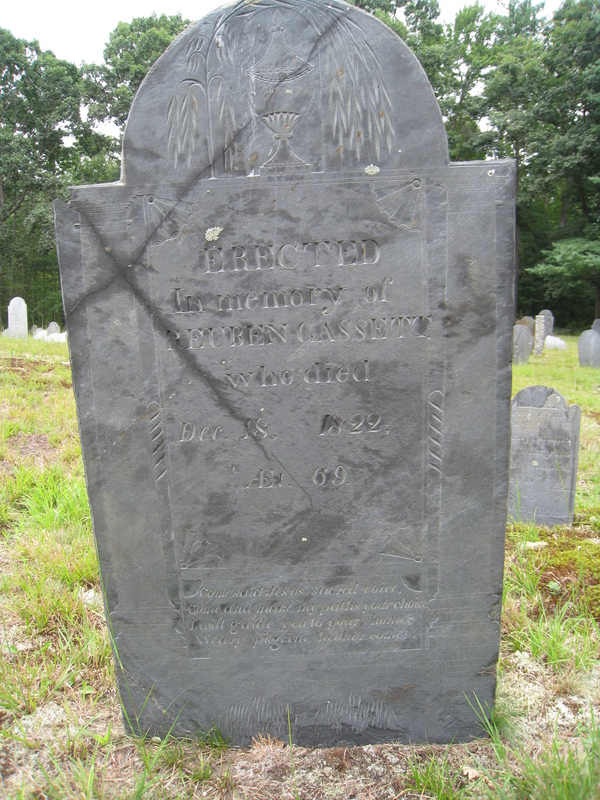 John Minot’s Company, Col Josiah Whitney’s regiment; arrived at Rhode Island May 10, 1777; discharged July 9, 1777, service, two months, ten days. No address given, but the company was raised in Townsend and nearby towns, Third Corporal in Capt. Aaron Jewett’s company, Col. Job Cushing’s regiment, enlisted July 27, 1777; discharged August 29, 1777. Service, one month, 10 days. Private in Capt. James Hosley’s company of volunteers, Col. Jonathan Reed’s regiment, enlisted September 26, 1777; discharged November 2, 1777. Service, one month, 15 days. Sergeant, Capt James Hosley’s co of Minutemen, Colonel William Prescott’s regt., which marched on the alarm of April 19, 1775, to Cambridge; discharged May 4, 1775; service, 18 days, reported returned home. Private, Capt. William Greenleaf’s co., Col. Job Cushing’s Regt. ; enlisted Sept 3, 1777, discharged Nov 22, 1777, service, 3 mos. 7 days. Roll dated Lancaster. Private, Mass. Militia. Continue to search and evaluate the Mass. Soldiers and Sailors volumes (which are available online), where most of the data used in these SAR applications is from. Chart the regiments and units mentioned. Follow up on another source mentioned in a SAR #15669 concerning John Emery: “Rev. Rolls, Mass. Archives, vol. 12, p. 115, vol. 19, p. 177.” The Massachusetts State Archives is located in Dorchester. Many pre-1970 SAR applications are now found on Ancestry.com so I can continue to access them. Likewise Ancestry.com also houses some Revolutionary War rolls and I will continue to explore them. Mr. Christian made a good suggestion about exploring town histories that include military information. One such book that I have used is Sawtelle’s History of the Town of Townsend. I believe the only soldier mentioned here who got a pension (it went to his widow) was John Emery. I will continue to investigate pension records on Fold3.com and other places. Continue reading two books that are throwing a lot of light on this subject: “1776” by David McCullough and “The Minutemen and Their World” by Robert A. Gross. Just a little more proof and this guy will be my ancestor! Thanks to a lead about the birthplace of my great great grandfather Edward Baldwin, I have managed to discover a great deal of the Baldwin genealogy. But I wanted to be sure that the link between the people I knew and the rather well-documented family I found was real. Since my last post on finding the Baldwin line, I have managed to prove that this is the correct line. Miles Edward Baldwin, Sr was born in Belmont, New York around 1863. His father was named Edward Baldwin, from Massachusetts. When I discovered that Edward was from Townsend, Massachusetts, I used the standard Baldwin genealogy and other methods to narrow down Edward’s origin to one family. The family I found was Eli and Polly (Spaulding) Baldwin. Eli died at age 29 in 1833. Polly passed away at age 33, in 1839. This resulted in guardianship records, which showed that custody of Polly’s two children, Edward and Catherine, went to her brother, John Spaulding. This obituary is from the (Amherst, New Hampshire) Farmer’s Cabinet, 20 September 1833. Since the guardianship records showed that John Spaulding had already been housing the family for five weeks at the time of death, and since 33 year old Polly had made a will, I suspect Polly had a serious illness that led to her death. John Spaulding did not seem to have custody all the way to adulthood. By 1850, 17-year-old Catherine was living with her aunt, Harriet Spaulding. I cannot find Edward Baldwin in the 1850 census at all. I pick up with Edward’s life in 1860 in Belmont, New York, and 1863 or so when he became the father of my great grandfather, Mile Edward Baldwin. How to be sure these two stories are connected with the same Edward Baldwin? I turned to all the aunts and uncles of young Edward and Catherine, of which there are a total of 19 (children of Abiel and Lucy (Gassett) Baldwin, and Isaac and Lucy (Emery) Spaulding – one side note: of the 11 Baldwin siblings, the 8th was optimistically named “Finis” Baldwin; Finis ended up with 2 younger siblings, “Alpha” and “Henry”). 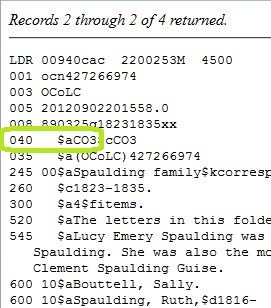 The Spauldings figured more prominently in the documents I found than the Baldwins. Another connection that was hard to ignore is that Edward had 2 children and named them “Miles” and “Harriet”, the names of two of the Spaulding siblings. An initial examination of all 19 siblings did not provide any actual proof of Edward’s relationship to them. But two of the Spauldings, Miles and Harriet, died childless, and Miles was in fact a wealthy physician in nearby Groton. It occurred to me that Miles or Harriet may have mentioned Edward in their wills; this possibility was made more interesting by the chance that Edward had already passed away before 1896 and 1907, when they died. The standard Baldwin genealogy, from 1881, lists Edward as deceased (The Baldwin Genealogy, from 1500-1881 by Charles Candee Baldwin, p. 717). So could Miles or Harriet have mentioned my great grandfather, Miles Edward, or his sister, Harriet? That would be even better for my purposes. 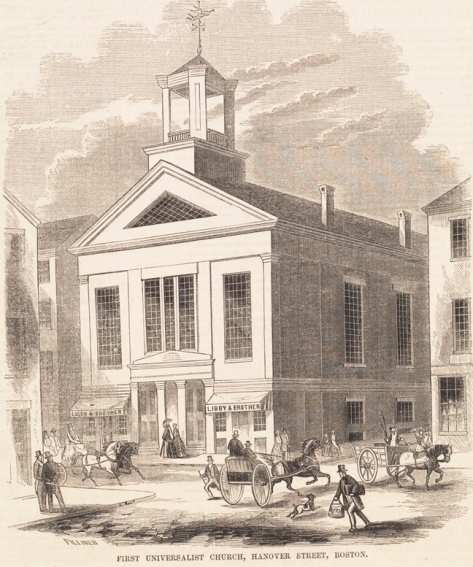 There was an initial trip to the Middlesex Probate Court in Cambridge, Massachusetts to order the probate records of Miles, Harriet, John, and Daniel Spaulding. Then came the day, last week, when the records were in and I was able to see them. The intestate records of John and Daniel were not helpful. But Harriet and Miles’ probate records provided me with the evidence I needed. These match the locations of my great grandfather and his sister. 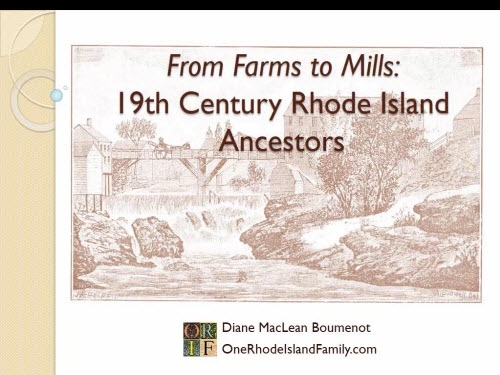 Now I can continue to learn about the Baldwin and Spaulding ancestors from Townsend, Mass. So far, Edward Baldwin seems to be the great-grandson of four Revolutionary War soldiers. I’m sure my grandfather didn’t know this; several generations of early deaths and moving around had closed the door on the Baldwin history for us. What Else Was in the Wills? The probate records held a few surprises for me. But Wait, There’s a Picture! Amazingly the American Antiquarian Society in Worcester, Mass. owns an ambrotype of Harriet Newell Spaulding. the picture looks right for a woman who would have been 38 in 1860. We don’t even have a picture of the younger Aunt Harriet, who was named for her. This is wonderful. If you are not entering your ancestor’s names into Google and selecting “Images” from the side menu, look at what you’re missing! 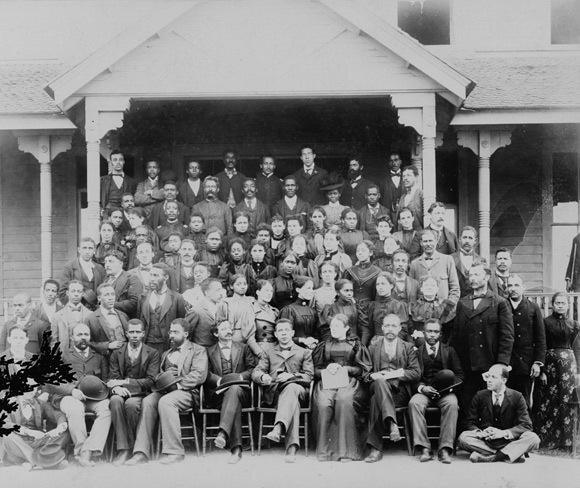 Tuskegee photograph CREDIT: “Faculty of the Tuskegee Normal and Industrial Institute, at Tuskegee, Alabama, seated and standing on steps in front of building.” March 1897. Booker T. Washington Collection, Prints and Photograph Division of the Library of Congress.